P. Pringsheim, “Zwei bemerkungen über den unterschied von lumineszenz- und temperaturstrahlung,” Z. Phys. 57, 739–746 (1929). M. Sheik-Bahae and R. I. Epstein, “Optical refrigeration,” Nat. Photonics 1, 693–699 (2007). A. Kastler, “Quelques suggestions concernant la production optique et la détection optique d’une inégalité de population des niveaux de quantifigation spatiale des atomes. Application à l’expérience de Stern et Gerlach et à la résonance magnétique,” J. Phys. Radium 11, 255–265 (1950). R. I. Epstein, M. I. Buchwald, B. C. Edwards, T. R. Gosnell, and C. E. Mungan, “Observation of laser-induced fluorescent cooling of a solid,” Nature 377, 500–503 (1995). J. Fernandez, A. J. Garcia-Adeva, and R. Balda, “Anti-Stokes laser cooling in bulk erbium-doped materials,” Phys. Rev. Lett. 97, 033001 (2006). N. J. Condon, S. R. Bowman, S. P. O’Connor, R. S. Quimby, and C. E. Mungan, “Optical cooling in Er3+:KPb2Cl5,” Opt. Express 17, 5466–5472 (2009). B. Zhong, J. Yin, Y. Jia, L. Chen, Y. Hang, and J. Yin, “Laser cooling of Yb3+-doped LuLiF4 crystal,” Opt. Lett. 39, 2747–2750 (2014). A. Volpi, G. Cittadino, A. Di Lieto, and M. Tonelli, “Anti-Stokes cooling of Yb-doped KYF4 single crystals,” J. Lumin. 203, 670–675 (2018). D. V. Seletskiy, S. Melgaard, M. Sheik-Bahae, S. Bigotta, A. DiLieto, and M. Tonelli, “Laser cooling of a semiconductor load using a Yb:YLF optical refrigerator,” Proc. SPIE 7614, 761409 (2010). S. D. Melgaard, A. R. Albrecht, M. P. Hehlen, and M. Sheik-Bahae, “Solid-state optical refrigeration to sub-100 Kelvin regime,” Sci. Rep. 6, 20380 (2016). A. Gragossian, J. Meng, M. Ghasemkhani, A. R. Albrecht, and M. Sheik-Bahae, “Astigmatic Herriott cell for optical refrigeration,” Opt. Eng. 56, 011110 (2016). M. P. Hehlen, J. Meng, A. R. Albrecht, E. R. Lee, A. Gragossian, S. P. Love, C. E. Hamilton, R. I. Epstein, and M. Sheik-Bahae, “First demonstration of an all-solid-state optical cryocooler,” Light Sci. Appl. 7, 15 (2018). D. V. Seletskiy, R. Epstein, and M. Sheik-Bahae, “Laser cooling in solids: advances and prospects,” Rep. Prog. Phys. 79, 096401 (2016). M. Sheik-Bahae and R. I. Epstein, “Laser cooling of solids,” Laser Photon. Rev. 3, 67–84 (2009). C. W. Hoyt, M. Sheik-Bahae, R. I. Epstein, B. C. Edwards, and J. E. Anderson, “Observation of anti-Stokes fluorescence cooling in thulium-doped glass,” Phys. Rev. Lett. 85, 3600–3603 (2000). W. Patterson, S. Bigotta, M. Sheik-Bahae, D. Parisi, M. Tonelli, and R. Epstein, “Anti-Stokes luminescence cooling of Tm3+ doped BaY2F8,” Opt. Express 16, 1704–1710 (2008). E. E. Brown, U. Hömmerich, E. Kumi-Barimah, A. Bluiett, and S. B. Trivedi, “Comparative spectroscopic studies of Ho:KPb2Cl5, Ho:KPb2Br5, and Ho:YAG for 2 μm laser cooling applications,” Proc. SPIE 9380, 93800O (2015). A. Gragossian, A. Volpi, J. Meng, A. R. Albrecht, S. Rostami, M. P. Hehlen, and M. Sheik-Bahae, “Investigation of temperature dependence of quantum efficiency and parasitic absorption in rare-earth doped crystals,” Proc. SPIE 10550, 1055006 (2018). S. Melgaard, D. Seletskiy, V. Polyak, Y. Asmerom, and M. Sheik-Bahae, “Identification of parasitic losses in Yb:YLF and prospects for optical refrigeration down to 80 K,” Opt. Express 22, 7756–7764 (2014). P. W. France, S. F. Carter, and J. M. Parker, “Oxidation states of 3D transition metals in ZrF4 glasses,” Phys. Chem. Glasses 27, 32–41 (1986). B. M. Walsh, “Spectroscopy and excitation dynamics of the trivalent lanthanides Tm3+ and Ho3+ in LiYF4,” (1995). A. Sugiyama, M. Katsurayama, Y. Anzai, and T. Tsuboi, “Spectroscopic properties of Yb doped YLF grown by a vertical Bridgman method,” J. Alloys Compd. 408–412, 780–783 (2006). S. Rostami, A. R. Albercht, M. R. Ghasemkhani, S. D. Melgaard, A. Gragossian, M. Tonelli, and M. Sheik-Bahae, “Optical refrigeration of Tm:YLF and Ho:YLF crystals,” Proc. SPIE 9765, 97650P (2016). S. Rostami, A. R. Albrecht, M. Tonelli, and M. Sheik-Bahae, “Advances in laser cooling of Tm:YLF crystals,” Proc. SPIE 10121, 1012101 (2017). S. D. Melgaard, “Cryogenic optical refrigeration: laser cooling of solids below 123 K,” Ph.D. thesis (University of New Mexico, 2013). F. Cornacchia, A. Toncelli, and M. Tonelli, “2 μm lasers with fluoride crystals: research and development,” Prog. Quantum Electron. 33, 61–109 (2009). S. Rostami, Z. Yang, A. R. Albrecht, A. Gragossian, M. Peysokhan, M. Ghasemkhani, A. Volpi, M. Tonelli, and M. Sheik-Bahae, “Advances in mid-IR solid-state optical cooling and radiation-balanced lasers,” Proc. SPIE 10550, 105500Q (2018). K. Yin, B. Zhang, G. Xue, L. Li, and J. Hou, “High-power all-fiber wavelength-tunable thulium doped fiber laser at 2 μm,” Opt. Express 22, 19947–19952 (2014). N. Simakov, Z. Li, Y. Jung, J. M. O. Daniel, P. Barua, P. C. Shardlow, S. Liang, J. K. Sahu, A. Hemming, W. A. Clarkson, S.-U. Alam, and D. J. Richardson, “High gain holmium-doped fibre amplifiers,” Opt. Express 24, 13946–13956 (2016). W. A. Clarkson, L. Pearson, Z. Zhang, J. W. Kim, D. Shen, A. J. Boyland, J. K. Sahu, and M. Ibsen, “High power thulium doped fiber lasers,” in Optical Fiber Communication Conference and National Fiber Optic Engineers Conference, OSA Technical Digest (Optical Society of America, 2009), paper OWT1. D. J. Richardson, J. Nilsson, and W. A. Clarkson, “High power fiber lasers: current status and future perspectives [Invited],” J. Opt. Soc. Am. B 27, B63–B92 (2010). B. Anderson, A. Flores, J. Grosek, and I. Dajani, “High power Tm-doped all-fiber amplifier at 2130 nm,” in Conference on Lasers and Electro-Optics, OSA Technical Digest (Optical Society of America, 2017), paper SM1L.3. A. F. H. Librantz, S. D. Jackson, F. H. Jagosich, L. Gomes, G. Poirier, S. J. L. Ribeiro, and Y. Messaddeq, “Excited state dynamics of the Ho3+ ions in holmium singly doped and holmium, praseodymium-codoped fluoride glasses,” J. Appl. Phys. 101, 123111 (2007). G.-Z. Dong and X.-L. Zhang, “Role of upconversion in optical refrigeration: a theoretical study of laser cooling with Ho3+ doped fluoride crystals,” J. Opt. Soc. Am. B 30, 3041–3047 (2013). G.-Z. Dong, X.-L. Zhang, and L. Li, “Energy transfer enhanced laser cooling in Ho3+ and Tm3+-codoped lithium yttrium fluoride,” J. Opt. Soc. Am. B 30, 939–944 (2013). T. Kessler, C. Hagemann, C. Grebing, T. Legero, U. Sterr, F. Riehle, M. J. Martin, L. Chen, and J. Ye, “A sub-40-mHz-linewidth laser based on a silicon single-crystal optical cavity,” Nat. 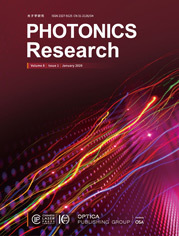 Photonics 6, 687–692 (2012). O. Graydon, “Payload success,” Nat. Photonics 12, 315 (2018). M. P. Hehlen, M. Sheik-Bahae, and R. I. Epstein, “Solid-state optical refrigeration,” in Handbook on the Physics and Chemistry of Rare Earths (2014), Vol. 45, pp. 179–260. G. Nemova, Laser Cooling: Fundamental Properties and Applications (Pan Stanford, 2017). S. R. Bowman, S. O. Connor, S. Biswal, and N. J. Condon, “Demonstration and analysis of a high power radiation balanced laser,” in CLEO 2011—Laser Science to Photonic Applications (2011), paper CMH4. S. Rostami, A. R. Albrecht, A. Volpi, M. P. Hehlen, M. Tonelli, and M. Sheik-Bahae, “Tm-doped crystals for mid-IR optical cryocoolers and radiation balanced lasers,” arXiv:1901.07737 (2019). G. Nemova and R. Kashyap, “Radiation-balanced amplifier with two pumps and a single system of ions,” J. Opt. Soc. Am. B 28, 2191–2194 (2011). J. Powers and P. Haus, Fundamentals of Nonlinear Optics, 2nd ed. (CRC Press, 2017). Fig. 1. (a) Anti-Stokes fluorescence cooling process in Ho3+ ions; (b) emission (red line) and absorption (blue line) spectra of 1% Ho:YLF crystal at T=300 K (λ=c/ν). The shaded region denotes the cooling tail (λ>λf=2015 nm). Emission spectrum is measured with a scanning optical spectrum analyzer under laser excitation at 1890 nm. The absorption spectrum is directly measured with an FTIR spectrometer under E‖c configuration (c is the optical axis). Fig. 2. (a) Schematic of mid-IR laser cooling and LITMoS test setup for Ho-doped crystals. (b) LITMoS test result for 1% Ho:YLF crystal; the theoretical fit to the data, using Eq. (1), gives the external quantum efficiency (ηext) and the parasitic (background) absorption coefficient (αb). The insets show two thermal images corresponding to heating and cooling regimes. Fig. 3. (a) Temperature dependence of the mean fluorescence wavelength (λf) for cooling grade 1% Ho:YLF and 1% Tm:YLF crystals. For comparison, data are normalized to room temperature values. (b) Temperature dependence of the resonant absorption coefficient of the I85–I75 transition in 1% Ho:YLF from 300 K to 80 K in 20 K steps (E‖c). (c) Cooling efficiency ηc(λ,T) versus excitation wavelength and crystal temperature. The blue and red regions correspond to the cooling (ηc>0) and heating (ηc<0) regimes, respectively, with the white transition line indicating the local minimum achievable temperature (MAT) at a given wavelength. The global MAT (as indicated by dashed lines) is ∼130±10 K at λ=2070±0.5 nm, which corresponds to the E12→E13 transition in Ho3+ (Ref. ). (d) Ratio of maximum cooling efficiency of the Ho:YLF sample over the optimal 10% Yb:YLF sample assuming various ηext and doping concentrations for Ho:YLF. Fig. 4. (a) Schematic of the CW-OPO design for mid-IR optical refrigeration in Tm- and Ho-doped crystals. (b) Phase-matching curve of the mid-IR CW-OPO. (c) Typical normalized narrow linewidth signal and idler spectra of the CW-OPO.